How to Enter the Edson Marine and Soundings Giveaway on Facebook: NO PURCHASE NECESSARY. Internet access and valid Facebook account required to participate. Online entry through the Giveaway Website only (as defined below); no other means of submission will be accepted. 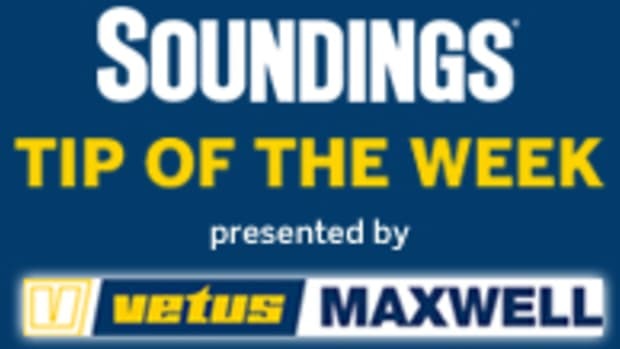 To enter, you must submit your Official Entry Form by visiting Sounding’s Facebook page at www.facebook.com/soundingsonline and completing the Giveaway Official Entry Form. You will obtain one (1) entry into the Giveaway for your Official Entry Form. Incomplete entries shall render the entry invalid. Giveaway begins July 9, 2012 and ends July 31, 2012. Eligibility: This Giveaway is only open to individuals who are 18 years or older at time of entry. This Giveaway is not open to any employees or their relatives who work for Active Interest Media or Edson Marine and its affiliates. Prize: One winner will receive an Edson Teak Rim Destroyer Wheel, 16” to 38” in diameter. Edson Marine will contact winner for size and wheel shaft specifications (straight, tapered or powerboat taper) to fit their boat. Estimated retail price ranges from $899 to $1300, depending on size. Edson part #645TK. Winner Selection: The potential winner will be selected, by Sponsor, in a random drawing to be held on or about August 1, 2012 from all eligible and qualified entries received in accordance with these Official Rules. The potential winner will be notified by email within twenty (20) days of the drawing at the email address provided by the entrant at the time of Giveaway entry. Please check your email and spam filters. If a winner cannot be reached for any reason whatsoever after reasonable effort has been exerted, or if he/she is found to be ineligible, the potential winner may be disqualified and an alternate potential winner may be selected, who will be subject to disqualification in the same manner.